Map showing location of Miranda Hot Springs . Use the controls on the map to zoom in and out. We’ve been here a few times, different days of the week. Although it seemed fairly quiet on Saturday what I did notice was the lack of staff actually monitoring the pool, it’s the same during the week when we’ve stopped off on our way to Whanga. I doubt many of the staff have ever worked in hospitality prior to working here as they aren’t very polite or friendly, the young ones seem to only know how to grunt, they don’t even have knowledge of the place the work at, general stuff like the size of the main pool, or what minerals are in the water. The food was good, still don’t know why we can’t pay for drinks at the same time as ordering our burgers. Obviously this place isn’t being run as a business, more of a hobby. Oh and the changing rooms, ok I get that they are pretty old, but considering there weren’t many people there they could have been cleaner. Stop off here occasionally on the way back from the Corromandel if we get on the road early enough. Not the most exciting of places but the kids like it. They like the bouncy pillow - if they get a chance to go on it when there's not a bunch of boys fighting each other on it (they're girls 4 & 6). They just need to wait for a gap no dramas there. Main issue I have is that I've been there twice on a Sunday evening, and both times the food shop has been closed. We're there around dinner time on the way home it's super frustrating as we want to get the kids some dinner. The Kaiaua fish and chip shop is about 10 mins up the road if you phone in your order it'll be ready by time you get there. Seems like people in the know take food and use the BBQ's provided. Other issue is the fact there's only 1 shower in the mens changing room which seems crazy for a place this size, and the facilities look like they haven't been touched in 30 years. Overall it's OK for a every now and again stop off but I find it pretty expensive for what it is I wouldn't rush back. I come here with my family reasonably regularly, for a swim and hamburgers for our dinner from the shop here. The burgers are really good. If you are looking for a modern aquatic centre with slides and a wave pool this is not the place to come to. Miranda has been there since I can remember, I used to come back in the 60s. The big pool was repainted in February this year, 2014. The changing rooms are dated and do need a spruce up, but we cope. (Recommend you wear jandals in there). Miranda has one large pool, a small very hot pool and a couple of small pools for little kids. Most adults soak in the big pool, it is a good temperature for soaking in. The rules about kids 8 years and under are the same in all public pools. We got told off once for not supervising our child - fair enough, although she has been swimming like a fish since she was 4, but rules are rules and I would not want the job of lifeguard - I would probably get grumpy too. They would get the blame if someone drowned. Miranda is a low key place, very pleasant and relaxing. It is dated but it's clean and generally seems well maintained. We go when we know it won't be too crowded, usually on a week night or Sunday night. Sometimes we are practically the only people there. We've never had an issue wth the staff being rude, but we all have bad days don't we? I just treat others as I want to be treated and my life goes well! Keep up the good work Miranda, you are part of our family's DNA. I visited in May 2013. I found myself with a couple of hours to spare as the drive from the airport to Thames took less time than I thought, even with a detour to Hunua Falls (go & see them!) so I decided to go to the Miranda pool. Fabulous! Such a big pool, at a perfect temperature for soaking (37-38) There is also a bubbling spa pool at one end at 42 degrees, too hot for me to stay in for more than 5 minutes. (And kids pools and private spas which I did not see.) On a cool but sunny May day there were only 4 elderly people there, nice to talk to, plus one man and young daughter came in as I was going. The change rooms were fine. My only criticisms are that the office staff could have been friendlier, and the paint was a bit flaky. I liked the outdoor lockers where you could keep your eye on your stuff. The café was closed when I went there. If I had known I would get so thirsty I would have taken bottled water in with me, as it was I had to pay top $ for a fizzy drink. I am looking forward to going back there on my last day in NZ next trip (May 2014). Miranda Hot Spring is open as of today. Thanks from the team at Miranda Hot Springs. After a very recent visit to Miranda hot springs I left feeling harassed and disgusted. The service was rude, over the pa a screeching lady demanded! parents to supervise their children. A totally inappropriate bloke with tats commented about other female customers costumes to my wife while she was buying drinks from the store, she was very uncomfortable after that and refused to go to the store further that day. And the time I went to buy something there was a different tattooed bloke in the store who refused to serve me? I had to wait several minutes for someone else to arrive to do so? The changing rooms and bbqs were very dirty! The prices were steep. The water in the big pool could have been hotter. All in all 1/10. Shame on you Miranda hot springs for poor service, standards and ignoring customer feedback, shame on you! Just read last comment. Sounds like you havent been to Miranda lately. They have recently re- concereted the changing rooms with non-slip. As for the jumping pillow it HAS been replaced with a new one. Non-swimmers are $8.00 ??? In all the times my family and I have been to Miranda we have never struck the staff as been rude, quite the opposite really have had lots of laughs with them all. There seems to be confusion amongst the reviews on here. Miranda Hot Springs is the hot pools. The Caravan and Camp Ground is nearby, and also has it's own little hot pool. Reviewers seem to be confusing the two. We have no opinion about the Hot Springs because we haven't been (yet), but the Campsite's pool was very nice. The lady owner is also very proud of it and when you check in she'll tel you that it's the best site in NZ. This (she thinks) will justify the fact that this is the most expensive camp site in the whole of New Zealand that we could find on our 6-month tour, staying at around 150 sites. Although the pool is indeed great, the lady's 'Stalag Commandant' attitude also made it the least enjoyable site in new Zealand. She dictates where you park, and insisted that we had to be on crunchy gravel under strong flood lights with no privacy, no sleep and a huge air-conditioner motor running next to us all night. The rest of the site was empty, but she wouldn't let us park in a nice private quiet corner. Hated it, hated her. Don't go there. I love Miranda hot springs and would be a regular customer had I not been so very disappointed with my experience yesterday (Sunday) evening. I can handle the new 'premium' prices, but along with premium prices comes the responsibility to provide a service that's professional. We paid a rather huge price to be able to do what we always do - first relax in the private spa, then have dinner, then relax in the less-hot large pool. What we found after the spa was that the hot food shop was shut, this at 6.20pm on a Sunday night of the school holidays. The excuse on a sign was that they had run out of food. I think this is disgraceful: Miranda Hot Springs is miles from any other place for dinner, and it more of less spoiled our night and made paying the extra price to spend some time in the main pool pointless, as we were too hungry to enjoy it. But more seriously, when I went to the changing room, the rank smell over overflowing urine was overpowering. As there were no other changing options, I had to risk getting my feet wet and then risk passing this on to my shoes. I have to say, I'm tempted to report this to authorities. I know the place was busy, but there is no excuse for not keeping the facilities clean, and this was downright dangerous. It looked like the place was being run by all junior staff and there was no-one there I felt it worthwhile complaining to, so here it is. I'm very, very disappointed and so is my wife. A lovely place that's now, unfortunately, a memory of what should have been a romantic night for us, shattered. Returned to Miranda for the first time in ages over the weekend. A wonderful spot spoiled by poor service! I'm not sure who's running the place but they really need to brush up on their PR skills. William, I think that's his name is friendly enough but totally unprofessional! The guy is an idiot! As for the Indian lady on the front desk, very rude! The rest of the staff looked very despondent. Last time I was there some bald guy was in charge and the service levels were fantastic! Plus the pools were much hotter! I returned to Miranda recently after having been told it had sold. Pleasing to see many familiar faces including William who was his normal cherry self. Not the same without Shane (despite what Emily from Thames said!) Not nearly as friendly, as helpful, as professionally run nor, most importantly, as clean! Not nearly as hot either which was disappointing! I returned to Miranda last weekend for the first time in about three months and I was little bit disappointed. The prices had dropped which was pleasing, although the way they were advertised was very unprofessional. Come on, removing a professionally sign written price and replacing with black felt is NOT a good look! It's the little things like this that people notice when they first visit a place. The pool did not appear as clean as it used to be, nor as hot. And the staff, who are normally so pleasant, weren't their normal cheerful selfs. Where was Shane? That place rocked when he was in charge? I can't believe you let him go yet kept William? Still, Shane was a professional and incredible to deal with and as such would have struggled with such an unprofessional environment now! If anyone knows where he is tell him we miss him and the place is NOT the same without him! Is it true you dont have any qualified Lifeguards? I was here Sunday just gone, everyone in my group agreed that the toilets were dirty, smelly, and in need of some discenfectant, the staff weren't friendly or welcoming, the lifeguards spent more time gossiping than watching the pool, Drinks were bloody expensive $5.50 for a thickshake after paying $14 entry. I don't mind paying good money for good service, according to your sign you recently put your prices up, how can you justify it? Staff could do with some PR skills. Nice for a one off but a little overpriced. We have been coming here reasonably frequently over the last few years, we love it, our kids do too. The large main pool is awesome with the steps (recently repainted) descending into the pool on two sides, makes a great place to sit. Staff have always been friendly, changing rooms very basic, no doors for private dressing on the cubicles, but we always take Sarongs and hang them over the bar. Love heading to Miranda Hot Pools for a nice relax and unwind. Weren't expecting an awful lot after reading a ton of reviews but we just had a lovely late fall Sunday afternoon with the family. The reception staff were polite, helpful and pleasant. The staff at the kiosk were super personable, bloody quick and their food was streets better than any other hot pool setup in the Auckland area including overpriced Waiwera. The facilities were cheerful, pleasantly clean and well-maintained. If we were picky, all we would change is perhaps the green plastic roof in the changing rooms that makes you look like a corpse! Not a major however - we even took a series of ghastly photos of our blue lips and general hulk-like appearance! Overall we had a lovely surprise on our first visit to Miranda and will definitely be back. To our valued customers, We would like to inform you that we will be closed from the 7th of February re-opening the 14th of February, to re-paint our main pool. This is weather premitting. Sorry for any inconvenience this may cause. From the team of Miranda Hot Springs. Me & the whanau have always enjoyed this place its all good. Miranda hot springs will be closed Sunday 3rd November, Monday 4th November, Tuesday 5th November hopefully re-opening Wednesday 6th November due to major pump problem's. Sorry for any inconvenience this may cause. We will update when re-opening. Thanks from the team at Miranda hot springs. Sorry Joss you had a bad experience here at Miranda Hot Springs. Regarding the signage there is one in entrance way and one at the main pay window. There's also six other signs plastered all around the complex, each of these signs clearly state children 8 and under must be ACTIVELY SUPERVISED - this means in the water in the pool. These rules are made by Water Safety New Zealand and not by us as a company. Very disappointed with my one and only visit to these hot pools. My 10 year old grandson and I were staying at Kaiaua with my sister and her three grandchildren and thought we would take the kids as a treat. When we arrived the carpark was quite full including two buses of holiday programme children (July school holidays). After paying for the four children to swim and two adult non swimmers - we were told that children 8 and under were not permitted in the big pool without an adult (16 and over), they were expected to stay in the small pool. As my sisters grandchildren were all under 8 they were most upset to see the small pool - a toddlers paddling pool. To make matters worse one of the seven year olds had visited 2 months earlier with a non swimmer adult and was not told of this rule then! He spent an hour and a half in the pool. I have no issue with pool rules as long as the facilities accommodate those rules. No one should expect 5 - 8 year olds to sit in a paddling pool while everyone else is enjoying the bigger pool. The girl who took our money and then told us of this rule walked away when we started questioning. Another attendant was standing nearby and when one of the children cried with disappointment, she asked what was wrong, when we started to explain she wasn't interested either and she too walked away. We collected our refund and took our very disappointed grandchildren home. No where was there any signage to inform us of this rule and no where on their website is it mentioned. Seems the rule was made to cater for the busy school holiday period. We also noted that the child admission price is the same for the paddling pool as for the large pool. We will certainly not be returning. I go to miranda pools every year and have been doing so for a few years now, I haven't had any problems with the staff ever, they are always pleasant, sure the changing sheds aren't perfect but so what no place is perfect, I think if people don't like it, best don't go there again, but don't pull it to pieces let everyone make up there own mind about the place. Just got on here to read what the place is like after what I have read will not be going and will reccomend to other Auzzies not to either WAKE UP AND SELL THE COFFEE MIRANDA!!!!!!!! We, were enjoying ourselves but the lifeguards comments has completely soured ever coming back.Our 4 year old decided to get back in the pool, and yes we were in arms reach.The life guard came over and said to our son HAVE YOU LEARNT YOUR LESSON YET,MAY BE YOU SHOULD HAVE LEFT HIM UNDER A BIT LONGER. I find this totally inapproiate and disgusting. One big pool with a separate open air sauna on the side. The main pool is just the right temperature. It's a standard pool, with a maximum depth of 1.35m and several steps all along both lengths of the pool. Not much variety, but good value overall. On behalf of the team at Miranda Hot Springs, we would like to inform our customers that we will be CLOSED from the 13th of February 2012 and re opening the 19th of February 2012, for the re painting of our pools. This is weather premitting. Kiwitaste kitchen will be open from 5pm til 7.30pm daily. I think its quite good, the entry fee of $13 is a little steep for only 2 pools. The standards of cleaniness and facilities are excellent and the pool is very clean and inviting. I think its unfair that there is so much flack here from parents who can't be bothered doing their jobs. I noticed a lot of uncontrolled kids and feel sorry for the lifeguard, he's a lifeguard not a babysitter, and as for rudeness, get over it and grow you are not royalty and the pool owners are not minders, they are honest hardworking people trying to do their job to the best of their abilities. I think its choice. lol been going there for years now myself never had a problem ? ( abuse and anger given back ) speaks for its self ???? 98 people have died in the water this year already, was there last sunday and seen two tiny tots pulled from under the water by staff, where was the parents ? just takes seconds. Going to Miranda Hot Pools has been a tradition in my family since before I was born. Unfortunately I will be in no rush to get there again anytime soon. 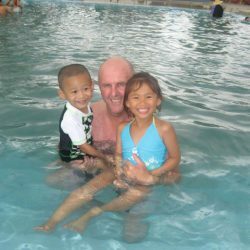 I visited during the school holidays with my parents and children and was offended when I had barely stepped a foot in the gate before a "lifeguard" accosted me and told me at least three times that my children had to be supervised and that I would be suprised at how many people wanted their children to drown (YES, you read correctly). I am definitely not against the rule of child supervision around water, but when you have a sign before you enter the property; a piece of paper handed to you when you pay; multiple signs around the pool; people blaring it over the speaker as well as someone in your face assuming you have come to swim but not to look after your own kids... well it's just a bit too much. I heard a rumour that there was a tragedy there recently, so can understand the emphasis on safety but there needs to be a balance of precaution and trust when it comes to your customers enjoying a day poolside with the family. At the time I felt uncomfortable with my welcome, so I thought the best thing to do would be to let the "lifeguard" know - perhaps he wasn't aware of how invasive his approach was. Afterall, how many other customers have felt the same way but not said anything? Well, to cut a long story short my mother and I were called 'hoity toity' by one of their staff and patronised by another. My initial approach to them was not threatening or in anger, but by the time I walked away I was very upset. We stayed for about 40 minutes (as my children thoroughly enjoy the place) and during that time not one of their staff came to follow up or apologise. Is the customer not allowed to provide feedback on service without abuse and anger being given back to them?? If I don't take my children there it will not be a tradition for them and you have just lost a generation of customers from my family. I went to Miranda on Thursday with my Mum and daughters.Was really pleased to see it so clean.I thought the takeaway menu was excellent,friendly staff and fair prices.BBQ facilites were great,loads of tables and shelter.There was absolutely no rubbish anywhere and the changing rooms are adequate and clean and tidy.The only minor constructive critiscism I would offer is if the toilet cisterns were bleached it would look better the green stuff although on the inside still looks gross to touch.Will definately return. I love miranda and so do my kids...but I agree with some of the people below. The womens toilets can get really smelly at times. Thats a sort of thing staff need to keep on top of. No excuses. The other thing is the last 4 times we have been (in 1 and a half years) the giant pillow has been out of order. its annoying because my son is 7 so hes too big for the little park they have there. plus a few of our big kids love it too. The staff can be really rude too i agree with that. and the prices are ridiculous. It was that time of the month for me so i couldnt swim, and i had to pay $12 to sit there. thats crap if eva i saw it. Miranda for our family is like a tradition. We have to go their at least 5 times a year but with all these things going on we may have to find another place to go to have fun. I wish it was like it used to be. We visited the Miranda Hot Springs Camping Grounds the end of April 2010 with our caravan and could not of wished for a more pleasant place to stay. The staff were just fantastic and helpful the kitchen facilities was spotless as were the showers and toilets. We have rebooked again to visit this wonderful place and would have no hesitation in recommending anyone with a motorhome or caravan to pay this place a visit. We stayed in Miranda Holiday Park for nearly 6 weeks in June/July 2009 and had a wonderful time. We are new immigrants to NZ from the USA and hope to settle in Mount Maunganui. Miranda was our first stop on the way to the Bay of Plenty. The park itself is beautiful and quiet. The hot mineral pools are heavenly to soak in during the cool winter days and evenings. Russ and Sasha, the managers, were exceptionally helpful and made our stay a joy. They had a few wonderful surprises for us ☺. The accommodations in Miranda Holiday Park have first class kitchen and bathroom facilities and great views over the pools tucked in palm trees and the Coromandel Range in the distance. The highlight in our apartment was a large spa/jacuzzi bathtub with a choice of either mineral or regular water. We could not have asked for more. Just 25 minutes away from the park is Thames, a small town and gateway to the lovely Coromandel Peninsula. We shopped for groceries and other necessities there. 10 minutes away is Kaiaua, an even smaller town on the ocean, with its award winning Fish and Chips Restaurant and Takeaway. In Miranda there is a bird refuge where we could spot many interesting species of birds from Antarctica. All in all, Miranda Holiday Park gave us a great experience, thanks to its outstanding management, staff and beautiful natural surroundings. 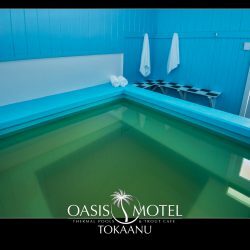 We recommend the park to anyone who wishes to relax in a quality place with some of the most charming hot pools in New Zealand. Lovely staff but the private spas left a bit to be desired!!! Not the cleanest water as we found dead skin floating in it. The bigger pool seemed cleaner! A top place to take kids. The jumping pillow is something else!! Well worth the drive. The water could be a bit cleaner, but all in all is a great time, every time. Can anyone tell me how much is the entry fee? I haven't been able to find it anywhere. I would give the website a 1/10. Had a really great time at the pools with the family. Would like to suggest that they pay some attention to updating the changing and toilet facilities in the future. Wouldnt take much but it would just top off a really fantastic family orientated swimming facility. The complaints that "Gary" has been making against our team and our pools are not justifiable. Last Sunday 6th July as quoted the cookshop was open till 8pm, and the staff member who runs the shop had taken a 10 minute break which she is by law entitled too. We have had hundreds of people come through our pools during these school holidays and most of these people have complimented to us on the cleanliness. The changing sheds and toilets renovation will be done in due course. The staff at Miranda Hot Springs have been involved with this establishment for over 6 years and some senior staff members have been involved in this industry for over 20 years. How can we improve our facilities to accommadate your needs if you are unable to communicate personally with our management. From the wonderful team at Miranda Hot Springs. 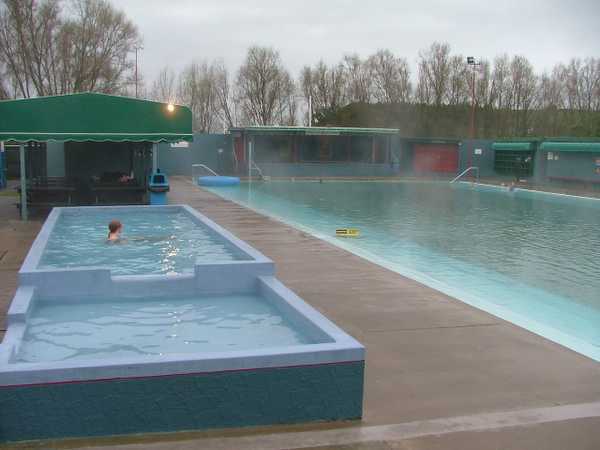 I wrote a disappointed review of Miranda Hot Pools back in April, noting that when I went the changing area was in a disgusting state, and also that early in the evening of the school holidays the takeaway food stall was shut... appalling because Miranda is miles from anywhere. Well, I went back there this last Sunday to see if there had been any improvements. Once again, school holidays, 6pm, and the takeaway stall was CLOSED with no explanation. Once again, the changing shed and toilets less than clean. It's interesting, I could swear that the owners/managers of this facility are TRYING to get rid of loyal customers. I've been going to Miranda for years and could remain a happy camper with even a small acknowledgment that they are trying to do something about these concerns... concerns which I notice other customers have expressed above. But when I complained last time, and this wonderful website sent my complaint to the pool's owners, there was absolutely NO response. Miranda Hot Pool owners, you could at the VERY LEAST address the concerns of myself and others on this site. Are you going to do ANYTHING to fix this situation? Miranda Hot Springs is a wonderful facility, a fabulous huge pool and (a bonus) it's not chlorinated. I love it, but can't justify supporting such slack management. Please tell me it's not true? 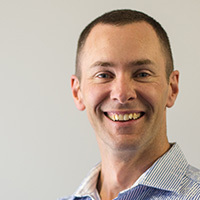 Is Miranda Hot Springs now owned and operated by the same family that run Waingaro? It wouldn't surprise me given the state of the the place. My friends and I come on average every six weeks but we've noticed over the last four months that the service standards and cleanliness have slowly deteriorated. Now we know why! It's an absolute targedy as we love the place but we won't be back! Having heard this place had been sold made me excited as i thought the new owners would upgade the place and restore it to its former glory. BUT it doesnt seem so, they seem to tight to do anything. I remember before it sold the old manager Shane telling me about the toilets getting knocked down and rebult, and that the plans had been drawn up and ready to go.... and since the the place has been sold and look they just replaced the roofs on the changing rooms with the cheapest materials that could be found. Also when i came in the other day i found that the hot food shop wasnt open so i went to the main office to enquire and was told it would not be opening because it was short staffed. I ask whether someone had called in sick or somthing and weather it would be opening later in the day and was told only if it isnt so busy because they simply dont have the amount of staff to do it. ABSOLUTLY PATHETIC! Then also i see a add in the newspaper claiming a fully refurbished sauna pool, but when actually it has just been given a coat of paint, not refurbished. And the paint job hadnt even been done properly as it had already started peeling when i was there. I dont know if it the staffs fault for not painting properly of the managment for being to tight and not wanting to spend another coat on the sauna. Also i noticed only half the complex had been newly painted a creamy coulor and the rest left that blue. I also queried when it was going to be fully painted and if it would be closed in that day and was told not to worry about it because the new owners told them to stop painting with that paint because it is to expensive. Hmmmm. Wow! Miranda is such a good place. And Im so glad they got rid of Shane, he was so rude. Yes, the pools could be hotter but they were still great. I will be back and will bring my family and friends. All I needed was to find a price list of entry costs so I could budget for my large family to visit the springs. This was like looking for a needle in a haystack. Come on guys. How hard is it to put the basics on your website? thanks heaps everytime i go there its always nice and relaxing i hpoe to go back for a holiday next time. Hi, having read the comments relating to that fateful day in December, I feel compelled to comment. Yes, the incident was tragic for all concerned, especially the whanau but to lay blame on the staff at Miranda I believe is unfair. I feel they reacted as quickly as possible once they realised the incident had occured and did as much as they could to assist, unfortunately to no avail. I'm sure they were traumatised by the event as much as anyone and the memory will live with them forever. It is easy to lay blame, but ultimately parents or caregivers are responsible for their children. Having been back to Miranda since, I know that they have taken measures to avoid such a tragedy occurring again. The complex is a bit dated but it is always clean and the service is on the whole excellent. A day at Miranda is always an excelleny day out! i have been frequenting the hot pool for some time now, all i can say is that it is definately the best place for a relaxing hot soak,clean, tidy and the staff are fantastic, the food is excellent, i cannot find fault in any aspect of the pools or it's management, i have been to three other hot pools and if you compare, then miranda comes TOP! Miranda Hot Springs has always been a popular outing place for our family, we celebrated my eldest sons 1st birthday there back in 1999, so we thought it would be a good idea to take our Baby boy there to celebrate his 5th birthday which was the next day. Even though that is a day that we will never forget we would like to express our DEEPEST OF THANKS to the "Concerned Aucklander" and the other people whom i only know as Stephen and Jane Leak, who helped revive my baby just for a short time for the family to say goodbye. We wish you all the best for the New Year. ''miranda hotspring is pretty unprofessional alright man thir website doesn't even tell you opening closing hours or tell you about days it will be closed! drove all the way from mt eden on dec 4th to find it closed! My last visit included giving mouth to mouth to a small boy who unfortunatley died later...that explains the reason the pools were shut on 3rd December! Do not think the staff will give you any assistance, they didnt even get the first aid kit out!!!! Hopeless, and even let the pool continue to be used while we were trying to save this boys life on the side of the pool, then after he left in the westpac chopper they had the nerver to have the pool patrolled by a bit of a kid with his arm in a sling..>STAY AWAY!!!! very disappointed, drove for eighty minutes just to find a sign on the gates saying the pools are clossed , NO signs on major turn off points so after driving all the way there just to return home . I WILL NOT GO AGAIN . It may have been a nice day if it wasnt for the counter staff. Megan was at the front desk and not only was she rude, unhelpful and sour but not at all customer focused. I would bring my family back if they got staff who were as pleasant as the manager. How people like her keep a job is beyond me!~! Great Pool, Great Water and Great Staff what more could you want ?. We spend xmas day here and had a great time, the owner brought around a huge xmas cake for everyone. Highly recommended. Well Done ! New guy william is making it better and better its just the best. go and enjoy $10 and you can come and go all day so cheap. cleanest water and pool ive been to and only 40 mins from auks. Good value, clean, good food. What more can I say. Brilliant on a rainy day and in the evening ultimate pleasure sitting in a hot pool. Recommended as one of my favourites. 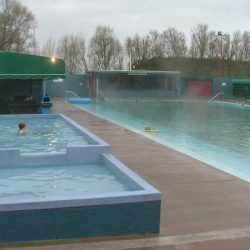 My Parents bought me here since I was a little girl now many years on I am so freaked at how much it costs to get in, if I went there for a whole week non stop I would've spent enough to buy Miranda Hot pools. Its not the same the cost just rips out the fun of a family day out. Was it suddenly renovated with gold? Come on guys! There are two pools here, run by separate ownership. The large pool at the back of the complex is a bit run down but is OK. If you are without kids, go to the pool in the campground - smallish, but very good. They charge $8 per person for casual use, or free if you stay overnight. The campground is of a very high standard. Wasnt aware of the private pool for $8. Been there several times, one for a work outing, lots of BBQ stands and picnic tables with and without shelter. Pool great fun which has large blow up shapes to play on etc, changing rooms quaint and a nice top pool to sit in which is shaded. Lots of outside open lockers to store your clothes while swimming too. Also has one of the best fish n chip shops in NZ just around the corner and there is always a queue for these! Plan for the whole day. lovely big pool, the mineral water is the nicest.